Our online exhibits in many cases extend and perpetuate the live exhibits we hold at the Historical Society. This allows us not only to display information from those exhibits – and thus bring them into reach of any one, any time – but to extend those exhibits if and when we see the opportunity to include information that may not have been available at the time of the live event. This online exhibit was built from material assembled for a live exhibition at the Westport Historical Society August 26, 2006, to September 4, 2006. It includes pictures, letters, documents, and accounts of whaling in Westport and the people who went whaling, or supported the industry on shore. This exhibition was on display at the Handy House in 2017 and 2018. We are indebted to the research of David Jones. 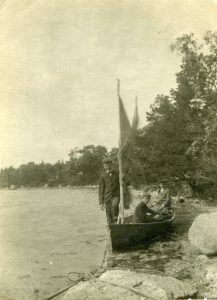 Additional images and information can be viewed at http://www.pbase.com/clamflats/westport_postcards. 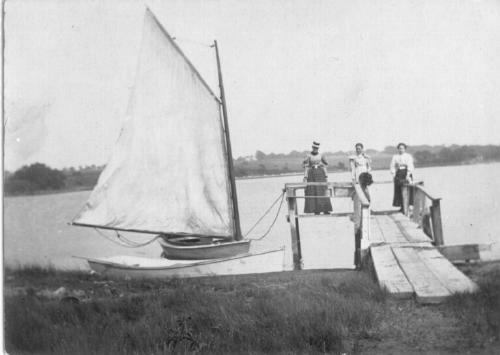 The community of East Beach is most notable for the fact that it no longer exists. 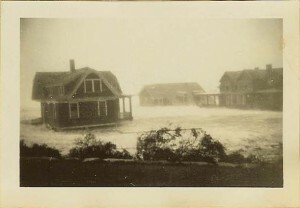 The small town that had developed along the beach in the 19th century was almost completely wiped out by the hurricanes of the 20th century. 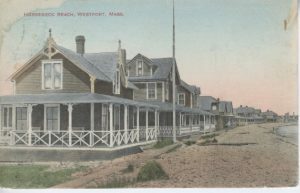 Despite its disappearance, the East Beach community was a village in its own right with a store, a church, a post office, 120 houses, a dancing hall and a bowling alley. It is also the location of the greatest tragedy in Westport’s history, the hurricane of 1938 during which 23 people lost their lives, most of whom were trapped on East Beach. Take a walk along East Beach, from east to west, to explore this once vibrant community. What does being on or near the water mean to you? 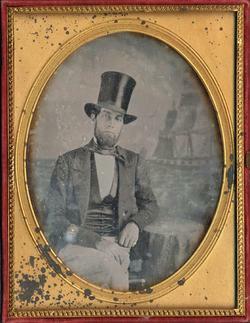 The photographs and related information in this collection were first exhibited at the Bell School in September 2003 by the Westport Historical Society. The images come from postcards from the collection of Al Lees Jr. Bette and Jack DeVeuve composed the captions. This exhibition examines the impact of four category three hurricanes that have swept across Westport. As memory of these events begins to fade, and as scientists continue to debate the implications of global warming, this exhibition aims to rekindle a healthy respect and awareness of potential effects of hurricanes.